← How can I offer $140 shirt for only $39.50? This requires to be upgraded to a full-post. You could send me a cleaned-up version or I can post your comment as a post. – Better conversion rate. As mentioned above, we attribute this result to eliminating the cognitive cost of plans. Wading through our massive features list to find the 1-2 dealbreaker features you needed wasn’t exactly a satisfying experience. One plan = easier. – Improved internal efficiency. By doing away with separate plan levels, we eliminate inefficiencies with everything from customer support to dev to QA. – Better customer satisfaction. No one likes to realize they need a particular feature, only to discover they have to upgrade in order to have access to it. We’ve now done away with that unfortunate situation. One example is customer support – which we consider our best feature. We can now offer full support to every user, rather than just those whose plans include it. Happy customers make us happy. Everybody wins. 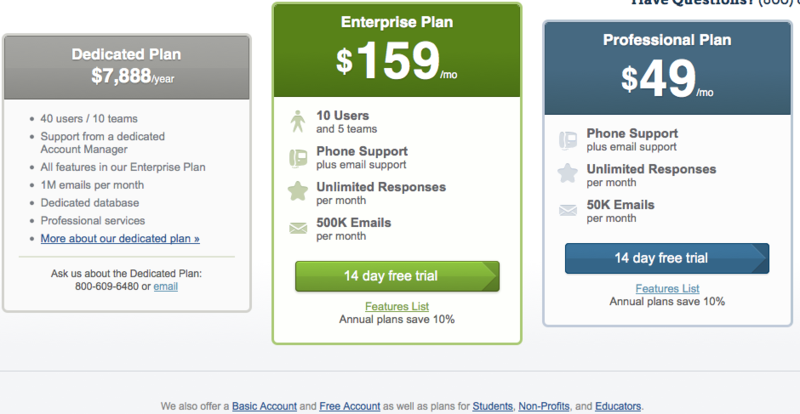 You can check out the new pricing info at http://www.surveygizmo.com/plans-pricing/. Thanks for sharing. I appreciate your willingness to share your experience with others. Well, you’ve got us. Looks like you found a gap in the split-test we’re currently running! While you saw the old pricing page before logging in, from within the app we currently only give you the option to upgrade to the new pricing plan. To respond to your post, you pretty much hit the nail on the head re: our pricing – we’ve been moving more and more towards Enterprise customers, and ultimately see the biggest differentiator between plans being number of users. We’re also big fans of simplicity here at SurveyGizmo, and in this case, it makes sense for us to test whether eliminating the cognitive cost will improve our customers’ experience. So thanks for noticing (& for the kind words)! We’ll let you know how it turns out!